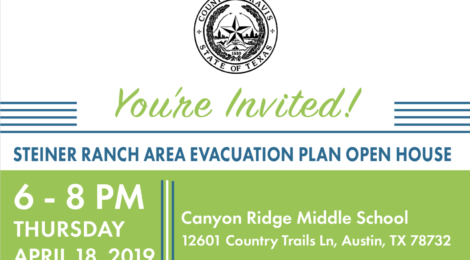 Join us for an open house to see updated and new information on the Steiner Ranch Area Evacuation Plan. The Open House will be come-and-go and staff will be available to answer questions. The Steiner Ranch Evacuation Plan is a capital improvement project proposed to provide an alternative evacuation route out of the Steiner Ranch area neighborhoods. If you plan to attend the open house and have special communication or accommodation needs, please contact Kathy Hardin at 512-854-7598 or by email SteinerRanchEvacRoute@gmail.com by April 15, 2019 to request assistance. For more information on the project, please visit www.traviscountytx.gov, keyword search “Steiner”.